I have absolutely nothing to blog about. Apparently sitting in front of the TV doesn't provide much blog material. My husband is in the office/guest/music room writing music on his keyboard. I am so special. I have my very own Bachelor soundtrack. Some people may find it weird to always have some sort of music in the background (guitar, keyboard, iTunes). But I have gotten used to it. There is ALWAYS music on in this home. So here I am watching The Bachelor, with a bag of Valentine's mini candy bars to keep me company. Do you know how dangerous that is?? I have managed to accomplish zero of my goals for the night. Well actually I did do a load of laundry and I managed to get it dry - but now it is just sitting on the couch staring at me, waiting for me to fold it. Laundry is my favorite household chore, however laziness is calling my name tonight. But I am impressed that I managed to get a load of laundry done and put new sheets on our bed. While I was taking the sheets off of our bed to wash them, I saw a medium sized spider crawling across the bed. But you should know: I'm not afraid of spiders. Really, I'm not. I have no idea why. I was just born this way. However, if it was a snake, I would have laid down and died. Anyways, I got rid of the spider (via the toilet) and then debated about whether or not to tell the hubby because he is scared of spiders. So about an hour after Luke got home, I decided to go ahead and let him know that a spider had invaded our territory, but not to worry, I would protect him. After I calmly explained the story of the spider, he told me that he found a spider in our bed yesterday but he didn't want to tell me because he thought it would scare me. I came out of this story with 3 observations. 2. We both think the other person is afraid of spiders - who is it really? 3. HE LET ME SLEEP IN A BED WHERE A SPIDER WAS CRAWLING? I mean, I'm not scared of them, but that is just sick. You're so funny! I did NOTHING I needed to do tonight either! I'm blaming it on the bachelor too. Oh well, there's always tomorrow!! I WAS doing laundry tonight, too. But then I had to quit because the Bachelor is way more important. Agree? Ha! Ohhhh I hate spiders. I sure don't want one anywhere near my bed! Sounds like y'all had a fun weekend. Ohh wow - I HATE spiders with a passion!!! There would be no sleeping for me in that bed - I'd have to sleep on the couch for atleast a week! I am absolutely terrified of spiders.... like freeze, can't breathe type of scared. If I found one in my bed I might lose my mind! Haha you make me laugh! I'm with you, spiders okay but SNAKES! No way! I would FREAK! Ewww, just the thought of a spider (or a Snake!!) crawling around on my bed gives me the shivers. You are brave! I probably wouldn't be able to sleep b/c of the nightmares the spider would have created! I, too was lazy watching the Bachelor last night. I sat on the couch last night watching the bachelor eating chocolate heart after chocolate heart. Why do I feel the need to buy valentine's candy and then display it on the coffee table??? Girl, I just love your posts. You are too funny! I need us to be friends in real life. HAH!! That is so funny! I'm not scared of spiders either, but if I see a roach I leave my house. Seriously. I can't handle them. One time I called Mr. Cup and told him to come home to kill a roach that was by our front door...good thing we only live 2 minutes away from the church! UGHHHH! Spiders are NOT my thing but watching the Bachelor instead of doing chores is!!! I didn't do a thing last night either. I found that the TV was WAY more important, so I suppose laundry will be toight. ICK. your too funny! Im not really scard of spiders but i sure dont want to share a bed with one! Oh girl you are SO strong! I have the worst fear of spiders EVER! If it was a snake I would be ok...but those eight legged freaks....no sir!!! 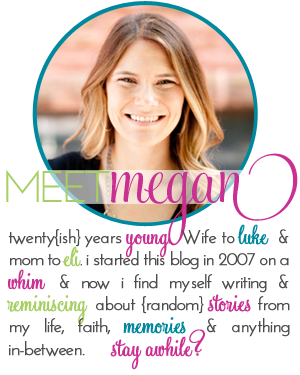 Megan I really love reading your blog because I totally relate. Last night was the hubs and I watching The Bachelor and folding laundry. It's nice to feel like I have someone to relate to as we are in a new city and only have each other for company. Lord willing we will make some friends at church soon. seriously number 3 made me spit rockstar. TOO FUNNY. so who do you want him to pick on the bachelor. I really like melissa. YUCK on the spider!!! but YEAH for a lazy night....we all need some more of those!! I HATE spiders and this post gave me the heebie jeebies!!! Yall are too cute though!!! Hi, new here. I just wanted to let you know you're not the only one. My BIG, STRONG, MAN is afraid of spiders too. BUT, that's just wrong that He let you sleep with it... LOL. Oh my word, I still freak out when I go into our guest room because years ago I was changing the sheets and found a huge spider in the bed...gross!!! I won't let anyone sleep in there now because I'm too scared for them! My husband is afraid of spiders. He will not touch them. I don't mind them much, but like you- if it was a snake I would have screamed bloody murder. What is it about snakes?